In Mark O’Rowe’s feverish 2007 drama, Terminus, there is an image of a man dangling from one of the multitude of construction cranes on the Dublin skyline. 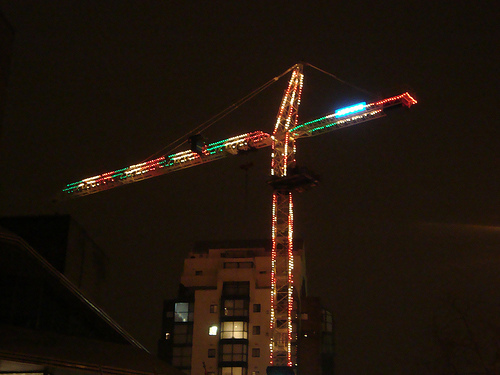 The crane became an icon of construction-fuelled Celtic Tiger Ireland. The post below conjures the nostalgic image of Christmas festive lights on a construction crane smiling warmly down on those below. Would that this image was a warm and reassuring one for those on this island. 1000 Awesome Things | A time-ticking countdown of 1000 awesome things. We do a similar thing with a bucket truck. While a crane is more awe inspiring, I like to think of our truck as a fun attraction for passersby on I-35E in Lewisville, TX. Check it out at http://www.buckettrucksonline.com/decorate-for-christmas-with-bucket-trucks.php.